There are two things that I have to hide from my husband if I plan on using it in a recipe: dark chocolate, and nuts of any sort. It’s like he has a radar or something. A bag of almonds can disappear in no time, man. 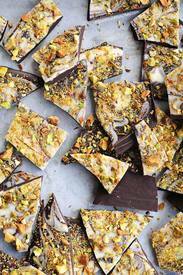 So you can only imagine when I combined dark chocolate and pistachios to make this Pistachio Chocolate Bark Recipe how much his choco-nut radar was going crazy. But then—the wacky guy—he actually asked before tasting it if it was good. What’s not to be good? It’s chocolate and pistachios. A no-brainer in my book, and apparently in many other’s books too.